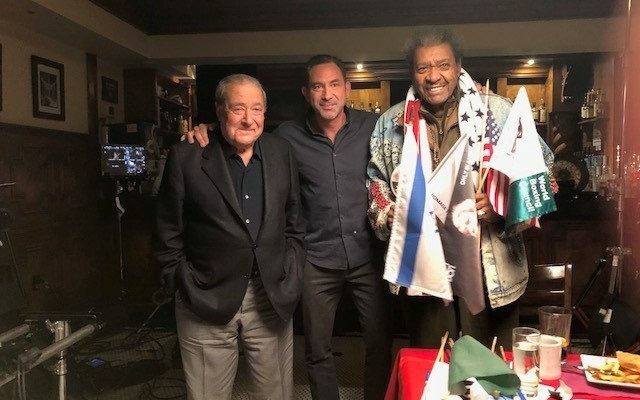 Saturday night’s Top Rank on ESPN will include a ten-minute feature of ESPN boxing commentator Mark Kriegel at a recent meeting with famed boxing promoters Bob Arum and Don King. A preview of it will also air Saturday morning during the 8 and 10 editions of SportsCenter: AM. In the piece, Arum and King sit down for lunch and conversation with Kriegel at New York City’s legendary Jack Demsey’s, a popular sports bar steps away from Madison Square Garden, and trade friendly barbs on their careers, the value of “interesting” competition and longevity, and predict who will win Saturday night’s St. Patrick’s Day bout. I never saw anybody eat as much and drink as much as this guy. In your dreams, the Central Valley kid is gonna win. I wouldn’t know how good I am if I didn’t have Bob as an antagonist and as a protagonist. When my guy knocks out his guy on Saturday, then we can go get Pacquiao. Saturday’s Top Rank on ESPN features top-rated contenders José Ramírez and Amir “Young Man” Imam in a battle for the vacant World Boxing Council (WBC) super lightweight world title headline at a St. Patrick’s Day at The Hulu Theater at Madison Square Garden. The event also features Irish Olympian Michael Conlan (5-0, 4 KO’s), from Belfast, who begins his sophomore professional year exactly where he started his freshman year — at The Garden. The Ramirez vs. Imam world championship event will air live and exclusively at 8 p.m. ET on ESPN and stream live on the ESPN App at 6 p.m. ET.